There are many things I love about Halloween (parties, fancy dress, an excuse to eat sweets, parties...) but most of all, it's a great excuse to make anything Halloween related. So I tasked my other half to come up with a Halloween themed recipe, and he's gone all out. So, I unveil to you....Rick's Boossaka! Yes, that's a Halloween themed moussaka. I know, inspired. Plus it's vegan, but you can substitute the non-dairy products for normal butter and milk if you'd prefer. Place in the oven at 220ºC for 30 to 40 minutes, or until golden. Assemble your moussaka, placing half the aubergine on top of the potatoes in an ovenproof dish. Add the remaining aubergine on top, except for one slice to be put aside for the Ghost’s mouth. Gently pour the béchamel sauce on top, spreading evenly. Grate the remaining cheese on top. Place in the oven for 20-25 or until golden and bubbling. Carefully decorate your Boo-saka with the aubergine in a ghostly shape. 1. Finely chop the onions and garlic, add to a large pan on a medium heat and add a teaspoon of oregano, a teaspoon of rosemary and a splash of oil. After a few minutes, stir in the chickpeas, lentils, bay leaves, tomatoes and teaspoon of marmite. Season with salt and pepper and bring to the boil, then reduce the heat to low and simmer for 1 hour, stirring occasionally. 2. 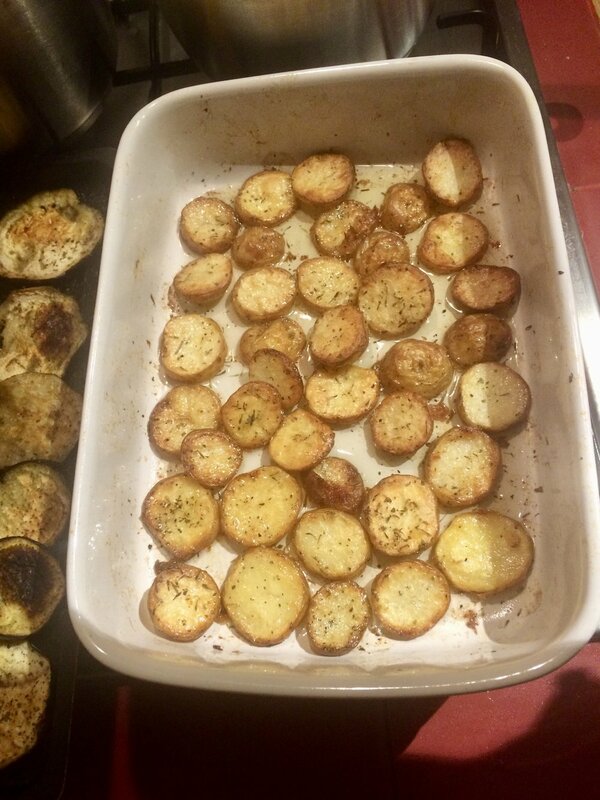 Chop the potatoes into roughly 1cm slices - enough to cover a large roasting tray or ovenproof dish. Drizzle with oil, season and scatter over a tablespoon of dried oregano and a teaspoon of rosemary. Toss well, coating them all and spread evenly. Place in the oven at 220ºC for 30 to 40 minutes, or until golden. 3. Cut a few long strips of the aubergine skin and put to one side, ready to be chopped into thin strips, which will be the eyes for the ghost decoration later. Prepare the aubergines in the same way as the potatoes, but cut a little thinner. Bake in the oven for 15-20 minutes or until coloured. 4. For the béchamel sauce topping, make a roux by adding the spread/butter to a saucepan on a low-medium heat with a small splash of oil. Once melted, add the flour and stir to make a paste (roux). Add the milk a little at a time constantly stirring. Once all the milk has been added and you have a smooth, creamy sauce, stir in half the grated cheese. 5. Assemble your moussaka, placing half of the aubergine on top of the potatoes in an ovenproof dish. Next, spoon the ragù over, then the remaining aubergine on top - except for one slice to be put aside for the ghost’s mouth. Gently pour the béchamel sauce on top, spreading evenly, then grate the remaining cheese on top. Place in the oven for 20-25 or until golden and bubbling. Cut the aubergine skin you removed earlier into eyes and thin strips, place on a baking tray with a drizzle of oil and bake at the same time as your Boossaka. These will only need 5-10 mins. 6. When cooked, carefully decorate your Boossaka with the aubergine (it will be very hot) and serve alongside a Ghoulish Greek salad.